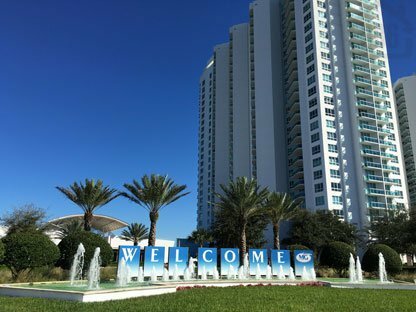 There is only one MG and it's located just outside Daytona Beach, Florida, offering breathtaking views of the Halifax River and Atlantic Ocean. Live your life to the fullest at MG on the Halifax, where luxury awaits you around every turn in this amenity-filled 26 story twin tower condo community. Just minutes from the fun and excitement of the “Worlds Most Famous Beach”, MG is miles away in atmosphere. Explore the river from one of the 32 private boat slips, and take comfort in knowing that MG on the Halifax offers onsite management, secured parking, manned, gated 24/7 security, front desk staff, and much more. This lushly landscaped 18 acres of riverside property also includes two heated swimming pools with hot tubs and generous sun decks. Just inside you'll find a state of the art fitness center, a Pilates/yoga/dance studio and a sauna. The 10,000 square foot clubhouse includes a formal banquet room, several private party rooms, a theater room and a billiards room. Each unit is adorned with imported Italian cabinetry, marble and granite countertops, GE Stainless steel appliances and designer tile floors. Add the voluminous 9' ceilings and private balconies. MG on the Halifax truly becomes your waterfront oasis. Call us today to explore available options at MG on the Halifax. Owner Financing! Impressive Views Looking Right Down The River. Two Balconies! Corner Unit! Quick Occupancy And Close! Ocean Views! Fantastic Amenities!